iGoogleBar is a Firefox extension that adds Google Apps favicons to the Google Apps Bar, using them as triggers for the Apps' respective iGoogle Gadgets. 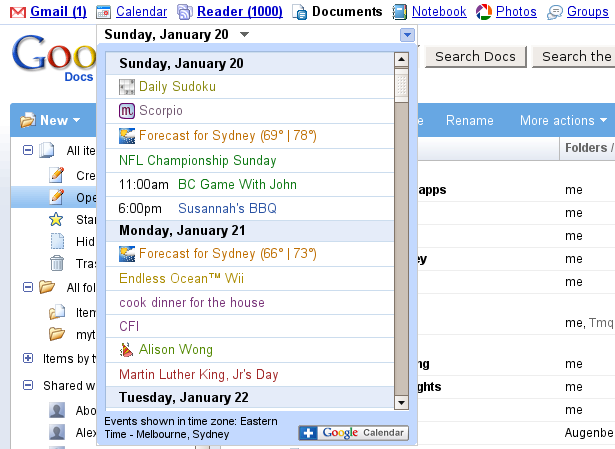 In the screenshot below, you can see how this can be used to check your calendar from inside Docs. It also shows unread counts from Gmail and Reader! Can I customize which Apps are displayed in the bar? Provide a nicer customization interface than about:config. Support Google Apps – currently, this only works correctly in personalized Gmail, Calendar, etc. How did you create iGoogleBar? I created iGoogleBar using Chickenfoot. Chickenfoot has a packaging tool built-in so it is easy to create a Firefox extension from a Chickenfoot script. Feel free to take a look at the source code for the iGoogleBar and then fire up Chickenfoot and make whatever modifications you like! If you already have Chickenfoot installed, you can just add the iGoogleBar Chickenfoot script as a "trigger" inside Chickenfoot rather than installing the standalone extension. The Calendar gadget does not refresh itself periodically to check for updates or to reflect day changes. You can always right-click and hit refresh to get it to update. If you are logged into some Google properties other than Gmail, you may get a dialog to enter your username and password for your Google Account because iGoogleBar is trying to load the RSS feed for your Gmail account. Loading a PicasaWeb album from the Gadget in Gmail borks Gmail. This could probably be fixed if the href was rewritten to use "target='_top'".